Doug Ross @ Journal: A Robot Stole My Job! 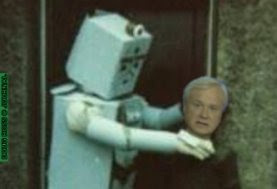 Echoing President Obama's recent assertion that ATMs cause unemployment, MSNBC's Chris Matthews cut loose on the economic devastation caused by "robots". In a Wednesday interview with the self-described Socialist, Sen. Bernie Sanders of Vermont, Matthews attacked technological prowess with his usual, spittle-drenched grace. I don't want to skip to your left on this but.... [W]hen I see automation, when I go to a CVS that used to employ a lot of people just above the poverty level, above the minimum wage. And you walk in there now, it's all machines... And by the way, I used to have about seven or eight cameramen. I don't have them anymore. It's all automated, it's all robots. Everywhere we go is robots! You used to go to a gas station, you'd have somebody would check your tires, check your oil. There ain't anybody there, there's nobody working at a gas station! Last month the President also claimed that the Internet is behind the nation's rampant unemployment. One of the challenges in terms of rebuilding our economy is – businesses have gotten so efficient, that, uh, when was the last time somebody went to a bank teller? Instead of using an ATM. Or, used a travel agent instead of going online. A lot of jobs out that that used to require people now have become automated. Apparently you have to be an economic illiterate to be a Democrat. Since the dawn of recorded history, scientific and industrial advances have raised the average standard of living, not lowered it. • In 1712, the invention of the steam engine touched off the Industrial Revolution, providing an inexpensive mechanical power source to replace manual and animal labor. • In 1733, the invention of the flying shuttle allowed a weaver to produce a wider band of cloth. This facilitated faster production of textiles for fabric, clothing and other uses. • In 1769, James Watt added a crank and flywheel to other steam engine improvements, providing efficient rotary motion for a wide variety of industrial uses. • In the early nineteenth century, the invention of the power loom -- a steam-powered, mechanical cloth-making machine -- allowed women to replace men in many textile manufacturing facilities. • In 1830, the invention of the sewing machine facilitated the "ready-made clothing" industry. All of these advances created brand new industries and began to free mankind from routine, manual labor. The sewing machine, for example, required hundreds of parts. These parts, made of many different materials, had to be manufactured and machined, often by dozens of suppliers. New companies arose to source these parts, new industries -- like repair services -- were created, and massive economic value was achieved through the creation of end products. Such is also the case -- multiplied by orders of magnitude -- with ATMs and the Internet. It's truly a shame and an outrage that we have leaders in Washington who no more understand general economic principles than they do quantum physics. Fortunately, the American people know what's going on: a new low of only 26% approve of Obama's handling of the economy. Related: "The Progressive and the Pencil". 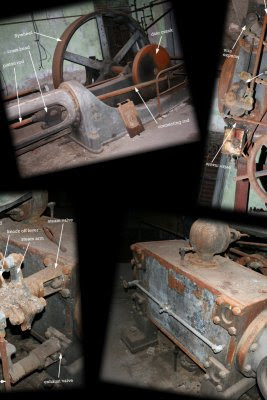 Image hat tips: The Corliss Engine. But Doug, The Humans Are Dead!